In (J. Comput. Phys. 229: 8105–8129, 2010), Li and Qiu investigated the hybrid weighted essentially non-oscillatory (WENO) schemes with different indicators for Euler equations of gas dynamics. 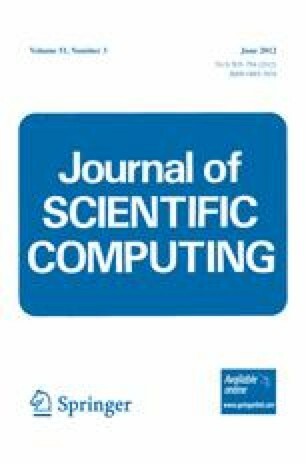 In this continuation paper, we extend the method to solve the one- and two-dimensional shallow water equations with source term due to the non-flat bottom topography, with a goal of obtaining the same advantages of the schemes for the Euler equations, such as the saving computational cost, essentially non-oscillatory property for general solution with discontinuities, and the sharp shock transition. Extensive simulations in one- and two-dimensions are provided to illustrate the behavior of this procedure. The research was partially supported by NSFC 10931004, 40906048 and Science research fund of Nanjing University of Information Science & Technology 20090203.